Curtis Childs will travel to join other internationally renowned science and spirituality thought leaders such as Gregg Braden and Bruce Lipton in London, England, where they’re set to speak at The Conference for Consciousness & Human Evolution August 25-27, 2017. To start things off, Curtis will take part in a panel discussion titled “Practical Philosophy” with Swiss philosopher Armin Risi and professors Drs. J.J. and Desiree Hurtak on Friday, August 25. His feature presentation, titled “The Origin of Thought,” will take place on Sunday, August 27. 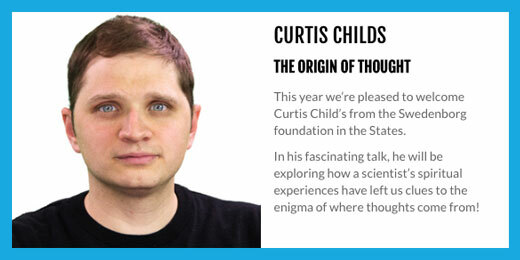 Curtis’s presentation will explore how Swedenborg’s spiritual experiences can help explain some of the more confusing aspects of consciousness and enhance the study of psychology. Can spirits in the afterlife affect how we think and feel? Are individuals part of a collective psyche? These questions and more will be explored during the program. Curtis is looking forward to presenting Swedenborg’s contributions to the studies of science, humanities, spirituality, and mysticism with an international audience of authors, scientists, philosophers, and spiritual seekers who will converge to explore the mysteries of life at the three-day conference. Our offTheLeftEye YouTube channel, which features the weekly Swedenborg and Life webcast, has accumulated more than 9 million views and over 50,000 subscribers since its 2010 creation. Curtis has appeared on numerous spirituality-themed talk shows and podcasts, and has had our “You Are the Lungs” video featured on the Dr. Oz Show. Our dedicated team works together each week to uncover the union of love and wisdom in all aspects of life—and share their findings with the world via the channel. Visit the The Conference for Consciousness and Human Evolution’s website for more details or read our full press release now!